Simply amazing. Lots of jokes, lots of in-jokes, lots of Lego, lots of fun, and lots of memories brought back. I’ve played with built with Lego for as long as I can remember, and I can definitely now relate to the “man upstairs” in the movie. This Sunday I took my kids, who are also lifelong Lego builders, to see The Lego Movie, and I think I enjoyed it more than they did. Grace Randolph of Beyond the Trailer, brought up on her show Morning Movie News that it may really be an animated movie for adults. She had heard of several instances where the adults in the audiences loved the movie but the kids only liked it, and theorized that this might actually hurt the box office appeal of the film. It had all the pieces necessary for a good movie. Humour, heart, great characters (a bit of a surprise for an animated film) and in the end, it meant something. I do need to see it again, and preferably from further back, our third row seats weren’t the best, and I will definitely be watching it again at home where I can pause often, because there was so much going on and probably so many things in the background that I missed and want to see. Also, because I went with my kids (who are aged nine to twelve) I didn’t get to sit all the way through the credits as I always do. Smaller bladders and general impatience prevented that. If anyone knows if there was an “after the credits scene” let me know! The story was quite fun, as Emmet Brickowoski (Chris Pratt) is a regular construction worker in Bricksburg where he lives life by following the instructions. Instructions passed down by President Business who is also Lord Business (Will Ferrell) the evil overlord who plans to destroy the world of Lego using the Kragle, his ultimate weapon. Emmet is soon mistaken for “The Special” of prophecy when he discovers the “Piece of Resistance” the only thing that can stop the Kragle. The other Master Builders now look to this ordinary guy to lead them and save the world. Unfortunately Emmet isn’t that creative (his whole life has been lived following the instructions) so he can’t build “outside the box”, he’s not that confident, and fears that he probably isn’t The Special. Full of great characters from Lego sets past, Emmet teams up with Wyldstyle (Elizabeth Banks), Batman (Will Arnett), Superman (Channing Tatum), Green Lantern (Jonah Hill), 1980s Blue Spaceman Benny (Charlie Day), Unikitty (Alison Brie), Shaq (Shaquille O’Neal), Metal Beard the pirate (Nick Offerman) and Vitruvius (Morgan Freeman) to stop Lord Business and his army of “micro managers” and the police lead by Bad Cop (Liam Neeson). I usually don’t like “big cast” movies because they tend to water down the story so that each actor gets face time, but that wasn’t really an issue here in an animated feature, and each character got to do something fairly important to the story. My one son’s favourite character was Unikitty, but my favourite was Benny, perhaps because 1980s Space Lego was a big part of my childhood (though we only had the Red, White and Yellow spacemen in my house…). Yes, it could be that adults will enjoy the film more than kids, but should we adults feel guilty about that? Is it a problem that we still enjoy our Lego sets? Is it a problem that we don’t let our kids touch them? Well, perhaps we all should watch The Lego Movie. And it’s never a bad idea for me to watch a movie again with my sons. Being a part time dad, sharing my experience of The Lego Movie with them may have biased my rating. 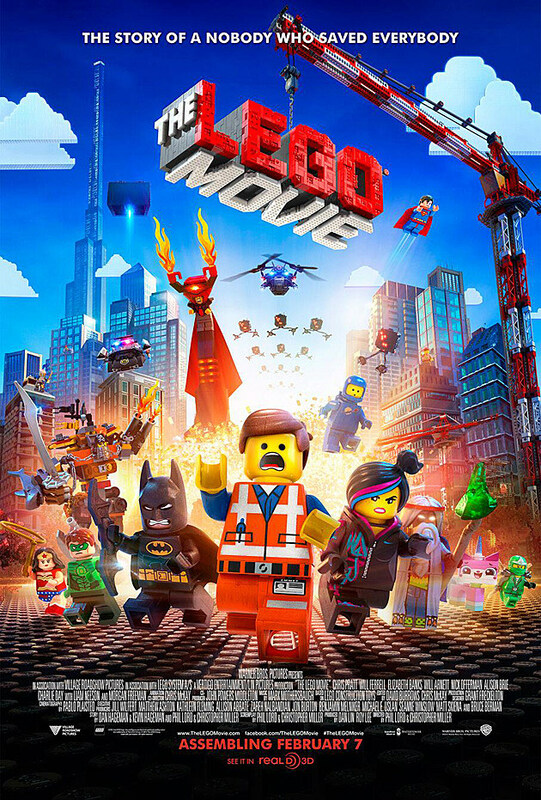 I have several movies that I enjoy only because of who I watched them with originally, but still I think my rating and enjoyment of The Lego Movie stand. Bottom Line: I think they have a good enough base here to build up to a sequel….puns intended.